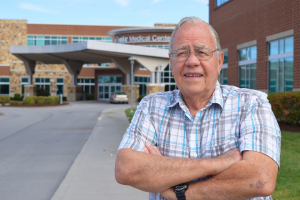 Gary Blunt wasn’t aware that Leconte Medical Center is an award-winning stroke center, but when he was wheeled into the hospital’s emergency department last September, he knew he was in good hands. Callie West, the stroke coordinator at LeConte Medical Center, attributes Blunt’s quick recovery (only one night in the hospital) to a team effort between the hospital’s stroke team, emergency physicians (Dr. Jerry Bradley, and Dr. Shamir Haji), and a neurohospitalist at Fort Sanders Regional Medical Center. Both LeConte and Fort Sanders are members of Covenant Health, which hosts the region’s only stroke network. LeConte Medical Center has received the 2018 Get with the Guidelines-Stroke Silver Plus Quality Achievement Award from the American Heart Association and the American Stroke Association. It is also recognized by the Joint Commission as an Advanced Primary Stroke Center with around-the-clock access to neurologists. 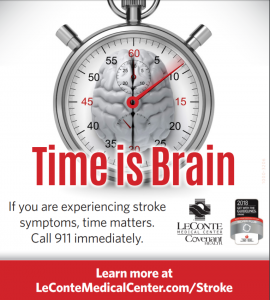 When it comes to a stroke, time is of the essence. Know the symptoms of a stroke, and call 911 immediately if you notice the signs.